it makes a great cat lover gift too! Cats enjoy climbing and perching on high places. A cat tower allows your cat to climb, play, and sleep all in one place. 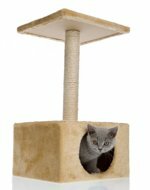 Cat towers will also help prevent your kitty from climbing onto and scratching your furniture. Furthermore, a kitty tower is a great idea for both active and not-so-active cats. Active cats will love climbing and jumping, while more laid back (and lazier) cats will enjoy sleeping and hanging out in the tower’s different platforms and trays. There’s something for everyone! And since many kitty towers already come with kitty condos, your cat will also have the perfect spot to sleep in! What is a kitty tower? A cat tower is a piece of furniture that consists of one or several shelves, cubes, or cradles (usually stacked one on top of the other) for cats to perch on and/or sleep in. Some kitty towers even have houses at the bottom and/or at the top of the tower. For cats, height and a spot to perch on are indeed the most important elements of a tower. There are towers of different heights. Some kitty towers come with one, two, three and even four trays! Most towers have carpeted surfaces, which is great for scratching. Some even come with additional sisal scratching posts. For additional fun, attach feather toys to the top of the tower. Kitty will spend a great deal of time playing! If you really want kitty to have fun, then you can get a floor-to-ceiling tower. As previously mentioned, some towers even come with kitty houses. This is a great feature, as it provides sleeping and playing areas all in one piece of furniture. Want a unique tower? Get kitty a tower with a built-in tunnel. Very important: The towers must be made of strong, sturdy materials to support the weight of your cat. The base of the tower must be wide enough to provide stability. This will prevent the tower from leaning and tipping over. Depending on the piece you buy, some assembly might be required.